Tech Valley High School depends on its connections in both the public and private sectors to provide its students with innovative educational experiences that help them develop the skill necessary for the 21st-century workplace. The Tech Valley High School Foundation is a critical piece of building those connections. The Foundation was established to solicit financial support and contributors to ensure that TVHS students have the necessary classroom resources for studies in advanced STEM-focused, project-based education. Connections through the Foundation have meant underwriting and sponsorships of equipment, programs and even rooms at TVHS, as well as innumerable hours of time given by industry experts, willing and uniquely able to connect the school’s educational programs with the real-world economy. 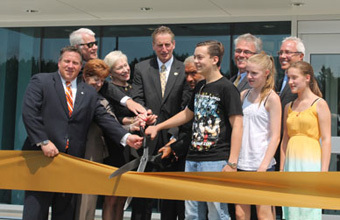 The Foundation was also instrumental in building the partnership with the Colleges of Nanoscale Science and Engineering at SUNY Polytechnic Institute, which became the school’s permanent home in 2014. Since the school’s inception in 2007, the Foundation has provided critical material and technical support, helping to foster the innovative student-centered education that engages students in current emerging technologies and supports the growth and economy of the region. Use the button below to donate to the Tech Valley High School Foundation via PayPal. We exist to transform high school for our students who want to succeed in a rapidly evolving world. Our volunteer board members meet regularly to discuss ways to gather and distribute special resources for use by TVHS. We leverage our community ties to form alliances with individuals, institutions of higher learning, for-profit, and nonprofit entities in furtherance of this objective. To advance the mission of TVHS by soliciting and receiving funds or contributions and by making grants to the school. To assist the school in forming alliances with business, governmental, higher education, and nonprofit agencies. To assist the school in researching, obtaining, and maintaining the technology and project-based instruction used by its students. To assist and support the technology education efforts of both BOCES. Foundation Board Directors are selected based on their passion for Tech Valley High School and commitment to its mission, their personal and professional networks, and their willingness to utilize those networks for the betterment of Tech Valley High School and its students. Directors are interested in action-based (as opposed to theoretical) public school reform and the development of the workforce of the Capital Region to meets its growing need for technology-savvy workers with strong professional skills. Directors should be able to attend, either in person or via conference call, at least 50 percent of the meetings held each year. Foundation Board of Director meetings are held from noon to 1:30 p.m. on the first Thursday of every other month. The monthly meetings are generally held in September, November, January, March, May, and July. Directors should be willing use their personal and professional networks to advance school goals. Directors should support the strategic planning efforts of the Board, both by providing input to these goals and by volunteering time to accomplish them. Directors need not contribute financially to the school, but should be willing participate in school fundraising efforts. Directors should aware of the workforce needs of the region and be outspoken advocates for the continuing evolution of the school to meet anticipated future needs.